NEAR GLOUCESTER, England (CNN) -- The Cooper's Hill cheese rolling contest is an age-old event, where specially-made Double Gloucester cheeses -- weighing seven pounds and measuring a foot in diameter -- are hurled from the hilltop, to be chased and retrieved by runners waiting below. But Monday's event took an unfortunate turn, leaving at least 18 people injured. Runners are supposed to chase the cheeses to the bottom of the very steep hill, with the first one over the finish line allowed to keep the cheese as a prize. But many participants didn't make it to the foot of the hill on foot -- they tumbled to the bottom instead. Some 4,000 spectators turned out to watch, but they didn't escape the mayhem, either. One man who tried to dodge a bouncing cheese lost his balance and tumbled 100 feet down the hillside. He was being hospitalized with a head injury. The winners didn't fare any better: postman Craig Carter, 21, winner of one of the four races, was left nursing a broken arm. But he took it in stride -- with a smile he said he broke his other arm when he won a race three years ago. A special event for women had to be delayed because ambulance workers were coping with two injured contestants. The origins of the cheese race are unclear, but it's believed to have started several hundred years ago, possibly as a pagan festival to celebrate summer. The spectacle is held in the heart of the cheese-making region of Gloucestershire. 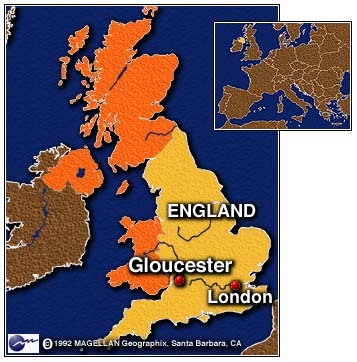 The area is known for its smooth, golden yellow cheese encased in a natural rind, called Gloucester or double Gloucester cheese.